My previous post told the story of a quest which came to fruition this past weekend. 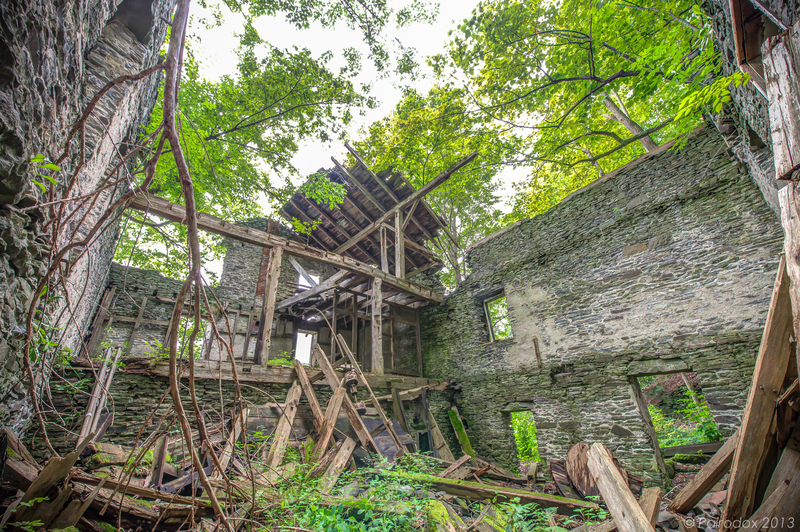 It told of discovery and of an old mill along Schenevus Creek near Worcester, New York. That contribution closed with a view through the east wall of the structure and level with its main floor. The image below was taken from the now-open floor below, from its corner to the north-east. The illuminated greenery shown previously is, in this view, to the left and growing from within the remains of first floor decking. I am not an archeologist but as I stood to capture this image I could feel the excitement for what a bit of exploration might uncover in the ruins beneath my feet. I was struck by what little remained of the roof, how precarious its remains were, and how the living canopy now spread across the void. What a beautiful place. I was both eager to explore and just a little bit concerned about the instability of the substrate. I remember, when I was a kid, a number of contests in which the winner was entitled to a timed run through a grocery or department store and could take home whatever he or she could collect and carry out of the store in a given, and very short, amount of time. I felt as if I were participating in such an event as I photographed this magnificent structure. The mill was the store and I hurried through it, grabbing photos before the much anticipated arrival of the landowner ended my time there. It never happened; one-hundred and twenty-two shots later Joanna and I got back in the truck determined to visit when fall colors shed warmer lights upon this delightful place. Click the image to view a version with higher resolution.